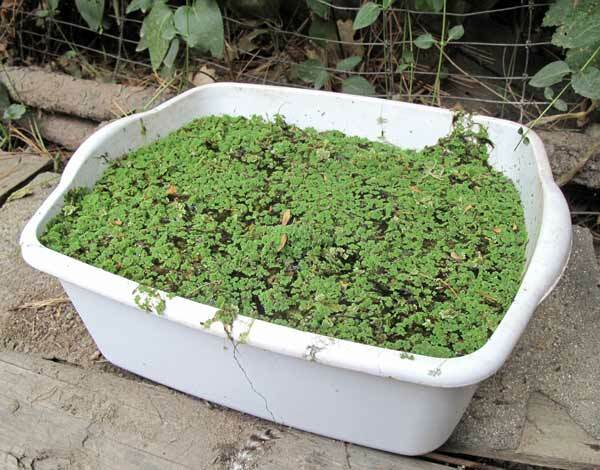 If you mention Azolla to people who sell pond supplies they will probably tell you that it is an invasive species and you should avoid it at all costs. But if you do a little research online you will also find that there are people calling this ancient floating water fern a superorganism! 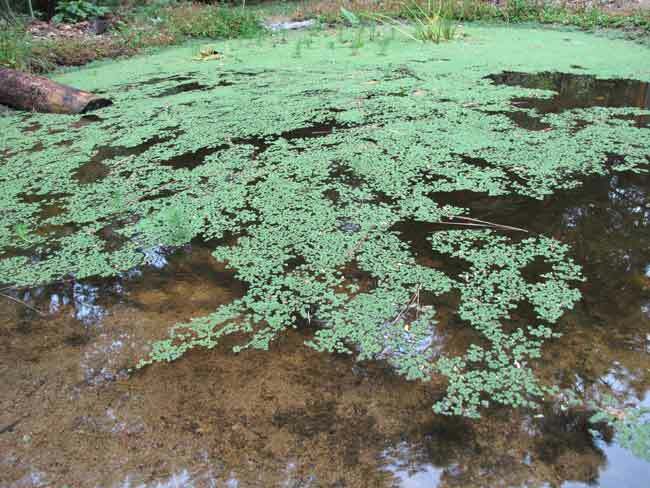 Azolla is no newcomer to the plant trade – it has covered water surfaces on our planet for over 50 million years. There was even a 800,000 year period where it covered the Arctic ocean – which was not salt water at the time – or frozen! It’s called the “Azolla Event”. It has been used as a nitrogen fertilizer in rice paddies in China and Vietnam for at least 2,o00 years. It was used as poultry feed in Peru at least back in the 1700’s when the Spanish recorded it’s use – so probably much further back than that. Because it has evolved symbiotically with a bacteria that helps it to draw nitrogen from the air as well as the water it is growing in, it is capable of doubling it’s volume every 2 or 3 days in warm weather! 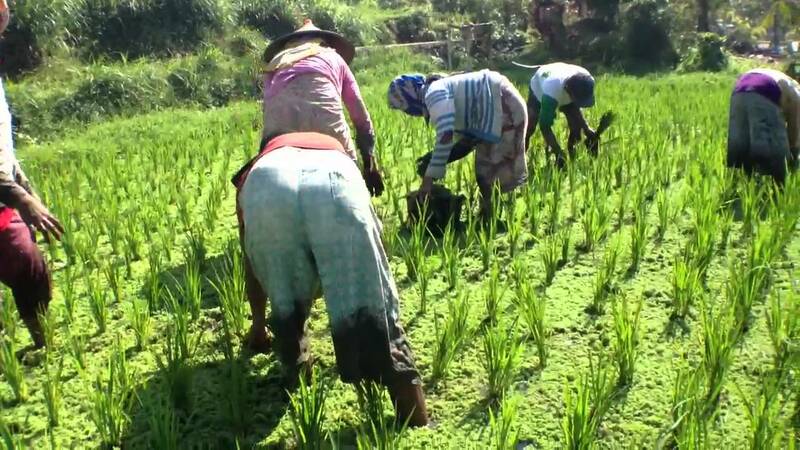 Here’s a little video of an Azolla harvest in a rice paddy. As I mentioned in my Chicken Feeding post it has been found to contain 25-35% protein which is not something that many plant based foods achieve. Protein is an important ingredient in the food of animals that lay an egg nearly every day. Most grains and seeds reach only a 9-15% protein and most of those are not something the average home gardener can grow and harvest in any sort of quantity – like wheat and oats. And grow without giving up any garden space. I read (haven’t tried) that it will grow in just an inch of water. It’s an interesting plant because it’s so very easy to grow – even if you can’t grow other plants you will probably be able to grow this one! I haven’t read of – or experienced – any insects or diseases that bother it. Heat and cold will slow it down – and enough cold will kill it. Did I mention that it doubles in volume every couple days?! That’s a pretty nice return for your effort and expense, considering that it’s not just a good animal feed, but excellent compost and soil amendment material (you just mix some in a planting hole as you plant). It could be used as bio-fuel and one of the things that I keep reading about is it’s ability to sequester CO2 from the air… Some studies also found that it is very efficient at pulling heavy metals and other toxins out of the water it is growing on. It’s also a plant that makes good people food. Well maybe not good exactly… I gather it tastes a bit like grass and so far I don’t think they have found many recipes for making it yummy, but NASA was studying it as a plant that could be taken and grown on long space flights. At any rate – in a pinch you could eat the stuff yourself… and give a start to everyone you know. It dries rather easily and can be fed to animals in a dry form as well. That might be an answer to the lower supply in winter. I’m planning on setting up some tubs in the greenhouse this winter but I think it will likely just keep it alive and not actually give us very much to feed. We will see. So nice to wake up to your smiling face, and blog, this morning…. Almost like we’ve had a visit! Re: “Pulling heavy metals and other toxins out of the water.”… I’m wondering, if it can do this, does the plant then store these toxins? Or is it able to convert the toxins to some safe compound before the chickens eat it, or it’s used as fertilizer? Great question, Bertie. There seem to be a lot of studies going on for using Azolla to decontaminate water and use it for waste water treatment. They are actually drying it and re-claiming the metals and then using the remainder as animal feed. I assume that if you had really contaminated water you wouldn’t want to feed the Azolla growing on it to your animals – or even use it in a garden. I mentioned the fact because it is one of the important ways in which Azolla may be used in the future. It truly is a unique and amazing plant. Azolla sounds like the wonder plant! Funny how ‘invasive’ can be used pejoratively when in fact that often gives plants a certain appeal as long as there is a use for them and they are not destructive (e.g. damaging to people’s houses). I agree, Helen. It is a bit of a quandary… On the one hand many plants were introduced (in the US by the Soil and Water conservation people) because of their wonderful vigorousness and resilience only to become invasive nuisances, like the kudzu vine (the kudzu is also a wonder food!) But I do think that we have come to have attitudes toward vigorous non-native plants that have adapted to their new climates well enough to not need human care – that are similar to those some have toward human immigrants. With climate change changing the game for ALL plants (and all live forms) perhaps we need to begin to look at the “immigrants” among us with new eyes… new perspectives. Out here in the Pacific Northwest Scotch Broom is thought of as an invasive – but it is a wonderful opportunist and nitrogen fixer and many creatures use the flowers and seeds. I used to be a great supporter of native plants… but I’m now looking at a different side of that story… as I think we all will in the time to come. Is Azolla not a native plant for your part of the world? In my last comment, I was thinking of all manner of plants from dandelions to mint.That said, there have been no complaints about these in the wild – it is more things like Himalayan Balsam (a type of non-native orchid) which are causing a problem there. I don’t know if it is simply because it is taking over from native wild flowers, though, or if people simply fail to see the relevance, for example. that we are so very ignorant of the relationships of living things and their role in the grand scheme of things… We just know so little… We introduce things in our ignorance and we rip and spray things out in ignorance…. I am learning more and more to question everything we think we know… about anything!